I've been writing this blog for nearly three years now, so it is high time I put together some of my favorite designs. I went through my polish posts and pulled my favorites from the years. I'd love to hear which one is your favorite! So many good ones! I can't pick a favorite, though Fly Away With Me is high on the list. I love Fly away with me. It's soo pretty! So many beautiful manis!! I feel so inspired now :D Thank you for sharing! I think they're all gorgeous, but my favorites are Spring Forward and Antique Lace. I have 4 favourites! 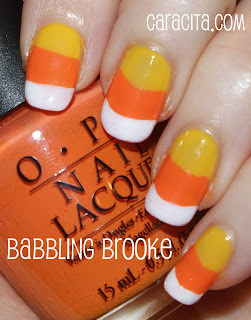 Spring Forward, Antique Lace, Candy Corn Nail and Mistletoe :D Absolutely lovely and cute and everything nice is on those nail designs of yours ^__^ Keep up the great blog! My favorite is the very first one. It is SO MUCH FUN. They are all gorgeous, but my favorite is Antique Lace. It's so delicate and chic! I like Fly Away the best, then Candy Corn! Wonderful! Cat Burglar is my fav. I love love animal prints. My favorite is flutter me away! spring forward 100% THE BEST. Ooohhh... I love Flutter Away! So pretty! THANK YOU ALL SO MUCH!! I REALLY LOVED READING ALL OF YOUR COMMENTS - IT IS SO FUN TO SEE WHAT DESIGNS OTHERS LIKE (AND TO SHARE MY FAVORITES!). POLISH DESIGNS CAN BE SO HIT OR MISS, SO IT WAS REALLY FUN TO GO THROUGH AND CHOOSE MY ABSOLUTE FAVORITES. THANKS FOR ENJOYING THEM WITH ME! They're all so gorgeous! My faves would be 3rd eye Blind (love the off-the-nail eyelashes) and Polka Dots/Shoes. Thanks so much Jenna and Queen of the Nail! !